The Competition Cheer Squad took first place in their division, plus first- and second-place individual honors, in the season’s first competition Nov. 11 at Lake High School. The team won the division for small Varsity squads, then went on to get the overall high score of the day, beating all of the medium and large Varsity squads as well. Medium and large divisions consisted of schools such as Minerva, Marlington, Canton South, Green, Perry, and Jackson. In addition, junior Allison Waggoner placed second in the jump-off, and freshman Khairee Mitchell placed first in the tumble-off. This year’s squad includes seniors Olivia Hart and Nyla Stewart; juniors Zynia Nicholson, Kylie King, Mariah Ohman, Allison Waggoner and Lauren Snyder; sophomores Ke’Aijah Hawkins and Seant’A Jones, and freshmen Jaycie Miller and Khairee Mitchell. They are coached by Mothersbaugh, Breanna Martin and Katie Arbitter. This group of girls - and guy - are members of the Varsity and JV cheerleading squads. They bring new skills to the table, including a full-twisting layout by Mitchell, Alliance’s second male cheerleader. “I’m excited to compete at NBC,” said Zynia Nicholson, a junior. The Northeastern Buckeye Conference competition will held in January. The team is also hoping to make to the state competition at The Ohio State University in March. “I really want to make it to State again,” said Mariah Ohman, a junior. Last year’s squad was only the third in AHS history to make it to the state competition. To make it that far, the team has to qualify at one of the regional competitions. That means training hard in the months leading up to the competitions. Coach Jaclyn Mothersbaugh said her goal for the season is to place in the top five at State. “Every single person is willing to work for it and do their part,” she said. The Competition Cheer Squad performed remarkably well in their first outing. More is expected from this team as they continue to work hard. 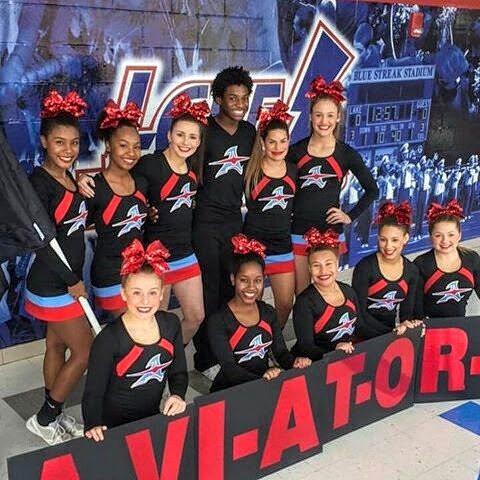 The Competition Cheer Squad competed at Lake High School on Nov. 11. They are (front row) Jaycie Miller, Seant’A Jones, Zynia Nicholson, Mariah Ohman, Olivia Hart (back row) Nyla Stewart, Ke’Aijah Hawkins, Lauren Snyder, Khairee Mitchell, Kylie King and Allison Waggoner. The Competition Cheer Squad placed first in their division at the Nov. 11 competition at Lake High. 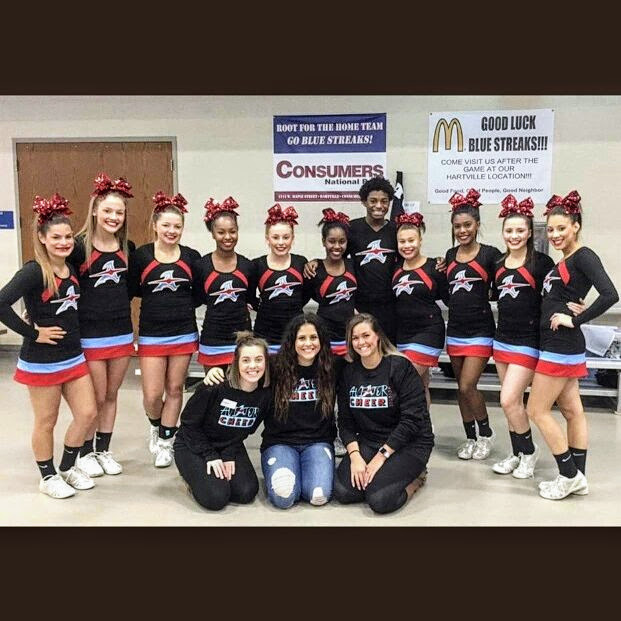 Shown are coaches Breanna Martin, Jaclyn Mothersbaugh and Katie Arbitter, plus cheerleaders Kylie King, Allison Waggoner, Olivia Hart, Ke’Aijah Hawkins, Jaycie Miller, Seant’A Jones, Khairee Mitchell, Zynia Nicholson, Nyla Stewart, Lauren Snyder and Mariah Ohman.